Can you get the cooling comfort you dream about without breaking your bank? Of course! There are summer energy and money-saving strategies that are simple and inexpensive. Here you will find knowledgeable tips that will help increase your savings in the long summer months. Investing in a new A/C is a good start in achieving your money-saving goals. Especially if your current air conditioning unit is not properly maintained or has reached its maximum lifespan, you really need to start searching for a replacement. Old air conditioners have reduced efficiency and consume a great amount of energy in the cycle. The replacement cost can be daunting, but the investment is worthy in the long run. A programmable thermostat allows you to manipulate the temperature inside your home even when you are not there. This is especially helpful for busy people who keep on forgetting to check their manually operated thermostat before leaving the house. You can even match the temperature to your schedule. When the thermostat learns your routine, it automatically adjusts the temperature so you’ll end up saving more energy and money. Dirty air filters make your unit work harder thus, consuming more energy than necessary. Aside from giving you a headache because of the high energy bill, you will also end up spending more on medical expenses. Maintain the efficiency of your unit and save your indoor air by replacing or cleaning your air filters regularly. The air conditioner and the ceiling fans are great partners. Ceiling fans give a wind chill effect to people, making you feel cooler and more comfortable. With this, you can reduce the thermostat setting by 4 degrees Fahrenheit without affecting your comfort. Ventilating fans are also helpful in keeping heat and excess humidity out of the house. We are talking about your insulation. Be sure to seal cracks and openings that will allow for the entry of hot air into your room. You can add weather-stripping and caulk around your doors and windows to seal air leaks. There are maintenance services that you can do yourself such as regular cleaning and making sure that nothing is blocking the air flow, especially in the vents and registers. For the complex parts, you can leave the job to the experts. 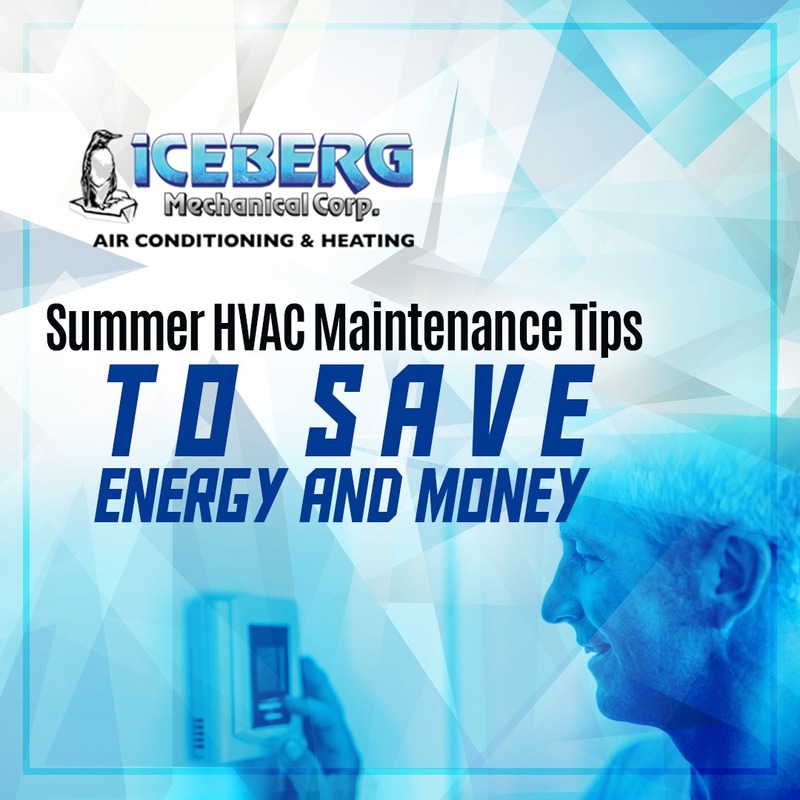 If you need friendly advice and helpful tips to keep your air conditioning unit running at maximum efficiency this summer, feel free to call the experts at Iceberg Mechanical Corp.